In a market that previously consisted of about three unique designs, things really have changed. That's where the Sony Vaio Tap 20 comes in. Sony has been growing its own crop of game changers. The Sony Vaio Duo 11 puts its Vaio design ethos into one of the niftiest sliding tablets we've ever seen, that's more than ready to compete with the likes of the Microsoft Surface and the Asus Vivo Tab and Vivo line. This 20-inch Sony Vaio Tap 20 does something else altogether. It's a little bit mad, to be frank: The Sony Vaio Tap 20 is, to all intents and purposes, a 20-inch tablet. 20. Inches. Tablet. So the first thing you'll do is pick it up like you might an iPad 4 or a Microsoft Surface because, after all, it's a tablet made for a giant, and that's cool. It certainly works as described, hefting the full version of Windows 8 and all of its apps and features. But you'll be unsurprised to hear that the Sony Vaio Tap 20 is too big, thick and unwieldy to slot properly into the tablet niche, unless you're OK with carrying around a giant 5kg (11.46lbs) slab of barely grippable and highly expensive electronics. Packing in enough battery to power that massive screen - and the not-insignificant Core i5 architecture within - has led to some serious compromises in aesthetics. The Sony Vaio Tap 20 is a pretty machine, but it's fat. Fatter than a tablet should be - at 504 x 312 x 45mm (19.85 x 12.29 x 1.78 inches) - and weighty with it. Maybe it's not a tablet at all, then. In fact, we're disappointed to admit, it isn't. 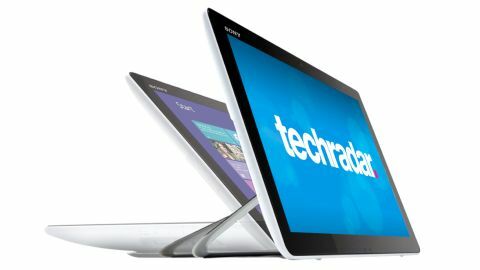 The Sony Vaio Tap 20 is an all-in-one PC. It should be filed with the Toshiba LX830, the Dell XPS One 27 Touch, the Lenovo IdeaCentre A720 and the rest of that distinct category of touchable desktops. That battery is in fact a cheeky bonus feature that turns a mid-sized touchscreen all-in-one into a mid-sized touchscreen all-in-one you can carry around wherever you go in the house. Some might call it a gimmick. In fact, that's what we're going to do: it's a gimmick. One that's going to have to fight to justify its existence.